The Pentagon said Monday's strikes, authorised by President Barack Obama, were in support of government forces currently fighting IS militants. "These actions and those we have taken previously will help deny ISIL a safe haven in Libya from which it could attack the United States and our allies," the Pentagon statement continued, using another term for IS. Pentagon spokesman Peter Cook said the strikes hit "precision targets", including a tank, in response to a request from the Libyan administration in the past few days. It now appears the US has formally started a sustained air campaign to degrade the IS group's capabilities in Sirte. The jihadists have been losing ground there in recent months, but the armed groups fighting it have been witnessing an increasingly high death toll. An advanced air campaign could speed up the removal of IS militants from their biggest stronghold in the country. The Pentagon has carefully attributed its latest move to the unity government's request to help its forces. But these anti-IS forces are only loosely allied to the government in Tripoli. 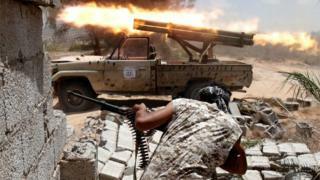 The wider military and militia forces across Libya are still embroiled in local rivalry. In the aftermath of campaigns of this kind, the US, and other countries involved in Libya, will probably be left with more questions than answers over the stability of the country and the local forces they backed. The government began an offensive against IS fighters in Sirte in May and said two weeks ago that it had made its largest gains to date. Western officials say the number of IS militants in Libya, previously estimated at 6,000, is declining in the face of concerted government action and pressure from other militia. Mr Cook said fewer than 1,000, possibly several hundred, remained in Sirte, and no US forces were on the ground in connection with "this operation". Media captionHow Islamic State's religious police operate in the Libyan city of Sirte. Libya has become increasingly divided since the fall of Muammar Gaddafi in 2011, with competing governments and rival militias seeking to gain territory and influence. The chaos had left Libya vulnerable to an influx of IS fighters, many from Syria. The United States has voiced strong backing for the unity government, or Government of National Accord, which began operating from the capital, Tripoli, in April. US Secretary of State John Kerry declared in May that it was the "only way to generate the cohesion necessary to defeat Daesh [IS]".